Plot – Desperate to enhance her prospects in life, divorcee and mother Joy (Lawrence’s) puts all her hopes and dreams into her invention of a self-wringing mop, an invention that could see her life changed for ever, for better or worse. After the one-two double whammy of the both equally praised and equally overrated Silver Linings Playbook and American Hustle, oddball director David O. Russell’s has taken his as per usual A list cast on a journey to of all things, the world of mops. Mop enthusiasts don’t often get the chance to see their beloved cleaning tools take centre stage in big budgeted Hollywood affairs so Joy, the at one stage mooted biopic of Miracle Mop inventor and TV sales star Joy Mangano, will likely be quite the event for them whilst for the rest of us (as Joy’s so-so reception over X-Mas will attest to), Joy will be a curious little experience that is highly unlikely to leave a lasting impression. A very uneasy mix of strange Russell infused comedy and family/trial over the odds drama, Joy has what seems like on face value the elements to create a really special something but with a bunch of characters that feel either underused or just not at all likeable, Joy’s central story of Jennifer Lawrence’s hard done by mother and inventor Joy’s journey with her wondrous new self-wringing mop isn’t the stuff of thrilling or inspiring big budgeted film making. Teaming up with Russell for a third time, Lawrence certainly is Joy’s biggest win. Her Oscar nominated turn as Joy is another finely tuned example of her talents as an actress that can see her change from comedy to dramatics in the blink of an eye and Joy is her biggest test as an actress since her breakout turn in Winter’s Bone and she’s more than up for the challenge. 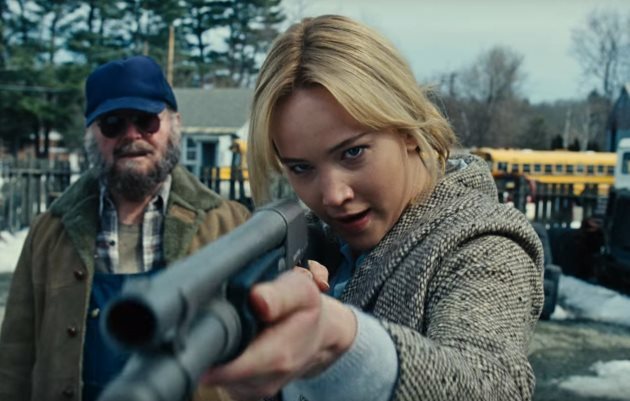 With Lawrence in awards worthy form, Joy’s lack of meaty narrative drive is further hampered by an underused support cast from Bradley Cooper’s TV big man Neill Walker, Robert De Niro’s frustrating fatherly figure Rudy and Point Break star Edgar Ramirez’s odd turn as Joy’s ex-husband Tony who all seem to be floating along in a plot line that was perhaps as uninteresting to them as it is to us. In some ways just as good as American Hustle (which isn’t saying much) and better than the downright tortuous Silver Linings Playbook, Joy is a watchable experience thanks to a spirited Jennifer Lawrence turn and a few nice moments but overall in the big scheme of things, Joy is yet another example of Russell’s flaws as a filmmaker that will eventually catch him out badly after a string of wrongly praised oddities. I remember watching the trailer for “Joy” and thinking, “This seems like it’ll be great!” I guess based on the reception It’s getting, the film is far from great. Yeh its not a disaster mate but its far from anything spectacular, I think O. Russell needs something different in his regime at the moment. Can’t say I disagree with your last line. Russell tried piggybacking off Silver Linings’ success. He’s gotta switch up the formula. Spot on mate! His just running with the same stuff now over and over. Exactly! Always appreciate the good conversation with you guys. You’ve got a fan all the way in Florida! Cheers mate, love to hear from everyone from everywhere so glad you’re on board 🙂 Always up for a good movie chat whether it be in agreeing or disagreeing ha. I liked this more than I was expecting to. It is somewhat underwhelming but nowhere near as bad as some of the reviews suggested. Yeh it was ok def not as bad as some of the other films of his career. This movie seems to have been standard, but nothing special. Won’t be rushing to check it out though. Great review! Its one to watch when all other options have been depleted. I like Lawrence but I thought that she was like a kid playing dress-up among the adults in this movie. Couldn’t buy her as a hard done by mother at all when she looked barely out of highschool for majority of the film. Nice points mate. I did like her performance but i can see your reasoning.